Powder coating is a type of coating that is applied as a free-flowing, dry powder. The main difference between a conventional liquid paint and a powder coating is that the powder coating does not require a solvent to keep the binder and filler parts in coating and is then cured under heat to allow it to flow and form a "skin". The powder may be a thermoplastic or a thermoset polymer. It is usually used to create a hard finish that is tougher than conventional paint. Powder coating is mainly used for coating of metals, such as household appliances, aluminium extrusions, drum hardware and automobile and bicycle parts. Newer technologies allow other materials, such as MDF (medium-density fibreboard), to be powder coated using different methods. The powder coating process was invented around 1945 by Daniel Gustin US Patent 2538562. While it is relatively easy to apply thick coatings that cure to smooth, texture-free coating, it is not as easy to apply smooth thin films. As the film thickness is reduced, the film becomes more and more orange peeled in texture due to the particle size and glass transition temperature (Tg) of the powder. Most powder coatings have a particle size in the range of 2 to 50 μ (Microns), a softening temperature Tg around 80 °C, a melting temperature around 150 °C, and are cured at around 200 °C. for minimum 10 minutes to 15 minutes (exact temperatures and times may depend on the thickness of the item being coated). For such powder coatings, film build-ups of greater than 50 μ (Microns) may be required to obtain an acceptably smooth film. The surface texture which is considered desirable or acceptable depends on the end product. Many manufacturers prefer to have a certain degree of orange peel since it helps to hide metal defects that have occurred during manufacture, and the resulting coating is less prone to showing fingerprints. For garage-scale jobs, small "rattle can" spray paint is less expensive and complex than powder coating. At the professional scale, the capital expense and time required for a powder coat gun, booth and oven are similar to a spray gun system. Powder coatings have a major advantage in that the overspray can be recycled. However, if multiple colors are being sprayed in a single spray booth, this may limit the ability to recycle the overspray. Powder coatings contain no solvents and release little or no amount of Volatile Organic Compounds (VOC) into the atmosphere. Thus, there is no need for finishers to buy costly pollution control equipment. Companies can comply more easily and economically with the regulations of the U.S. Environmental Protection Agency. A wide range of speciality effects are easily accomplished using powder coatings that would be impossible to achieve with other coating processes. Chemical pre-treatments involve the use of phosphates or chromates in submersion or spray application. These often occur in multiple stages and consist of degreasing, etching, de-smutting, various rinses and the final phosphating or chromating of the substrate & new nanotechnology chemical bonding. The pre-treatment process both cleans and improves bonding of the powder to the metal. Recent additional processes have been developed that avoid the use of chromates, as these can be toxic to the environment. Titanium zirconium and silanes offer similar performance against corrosion and adhesion of the powder. The most common way of applying the powder coating to metal objects is to spray the powder using an electrostatic gun, or corona gun. 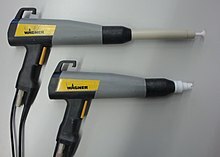 The gun imparts a positive electric charge to the powder, which is then sprayed towards the grounded object by mechanical or compressed air spraying and then accelerated toward the workpiece by the powerful electrostatic charge. There is a wide variety of spray nozzles available for use in electrostatic coating. The type of nozzle used will depend on the shape of the workpiece to be painted and the consistency of the paint. The object is then heated, and the powder melts into a uniform film, and is then cooled to form a hard coating. It is also common to heat the metal first and then spray the powder onto the hot substrate. Preheating can help to achieve a more uniform finish but can also create other problems, such as runs caused by excess powder. See the article "Fusion Bonded Epoxy Coatings"
Another way to coat and protect from back ionization and the Faraday cage is with a special wave board created by Spectracoat. They use a sophisticated system in their units to eliminate frustration from coating hard to cover areas. Another method of applying powder coating, named as the fluidized bed method, is by heating the substrate and then dipping it into an aerated, powder-filled bed. The powder sticks and melts to the hot object. Further heating is usually required to finish curing the coating. This method is generally used when the desired thickness of coating is to exceed 300 micrometres. This is how most dishwasher racks are coated. ^ DSM Coating Resins (October 2004). "Enlarging the Cure Window of Powder Coatings". Paint & Coatings Industry. Archived from the original on 2014-01-11. ^ "Stronger Greener Better". The Powder Coating Institute. 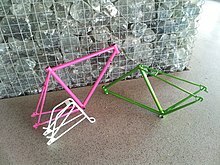 ^ "Powder Coating Services". MPPC Ltd. Archived from the original on 2017-08-08. ^ "Powder Coating Advantages". Reliant Finishing Systems. Archived from the original on 2017-09-30. ^ "Powder Coatings Market Size To Reach $16.55 Billion By 2024". Grand View Research. Archived from the original on 2017-03-07. Wikimedia Commons has media related to Powder coating.